I'm sure you guys have seen this trend already. 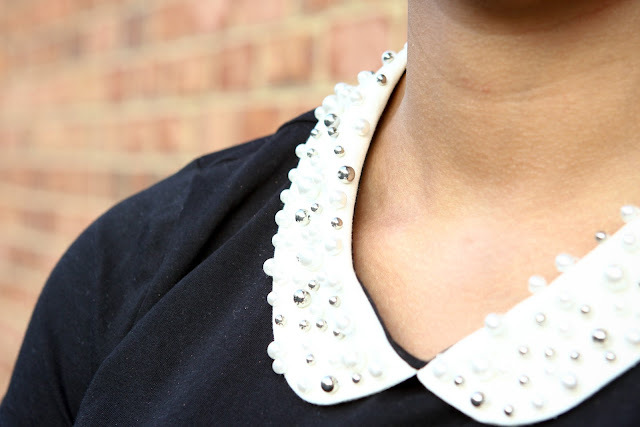 Bib necklaces and textured collars are everywhere and I'm loving it. The necklaces are awesome because you can add them to the simplest shirt and give it a whole new look. I like to think of it as the t-shirt makeover. You can add them to shirts, sweaters, and even dresses. It's the Fall's "it" accessory and it's also on my wish list. Now, this fancy little shirt from H&M was a steal. I love the pearls and the classic combination of black and white. Paired with high waisted skinnies, a red lip, and feminine heels; I gave the top a more modern vintage feel. Awe thank you soooo much Lucija :) I'd love to follow you. This outfit is gorgeous! That top is beautiful.